Regenerative Medicine today is in wide expansion. With increasing research efforts in this field, commercial manufacturing aspects for bio-product are getting more attention. From a GMP perspective, the most critical challenge due to specific factors characterizing cell manipulation is the asepsis of the process. This paper also highlights other critical factors in the process to present a complete view of the risks connected with this activity. A possible solution to these challenges is Isolation Technology, commonly used in the pharmaceutical industry and suggested by the regulatory guidelines in the field. Processes involving cell manipulation have a wide variety of application, from human tissue engineering to stem cells research and adoption. The scientific community acknowledges the enormous potential of this technology within Regenerative Medicine and Gene Therapy. On the other hand, today’s reality is more than just research and involves manufacturing capabilities subject to regulatory assessment. European GMP (Good Manufacturing Practice) concerning bio-materials are described in Annex 2 (Manufacture of Biological active substances and Medicinal Products for Human Use) where the requirements on the asepsis of the process are set forth and strictly relate to what is written in Annex 1, the fundamental regulatory basis for sterile manufacturing. So the important question is: are sterility and cross contamination important challenges in cell manipulation? The sterility or asepsis of the cell manipulation process can be assessed by examining a series of important factors in the adopted procedures. 1 – Cell manipulation is substantially a manual process composed of different complex steps during which cells are often directly exposed to the external environment. In classified environments, the first source of contamination comes from the human body; that is why strict procedures on operators gowning need to be implemented and frequent training sessions are required for all those people who need to work in a clean room. 3 – Laboratory equipment is not usually designed to undergo an automated decontamination cycle. Most of the time the lab equipment used, such as incubators, centrifuges, refrigerators and microscopes, is decontaminated manually by wiping with sanitizing agents. This is because the adoption of oxidizing agents like Vaporized Hydrogen Peroxide capable of usage in automated decontamination processes, nowadays very common in the pharmaceutical industry, is not so popular within laboratory equipment manufacturers. 4 – Starting material (cells) comes from hospital operating rooms where aseptic procedures are not under strict control due to technical limits and lack of training. This means the contamination can also be brought into the process from the original cells. Given these four factors, sterility in cell manipulation represents the most important challenge from a GMP manufacturing perspective and definitely the risk of contamination is higher than in common aseptic processing, used for example in the preparation of injectables. This means that a containment strategy (i.e. protection of the operator from the product) is also needed for these particular operations. From these observations we can conclude that we do have important sterility challenges, in terms of both aseptic processing compliance and cross contamination. So, what can be done? Is it possible to improve the asepsis in cell manipulation? If so, how? integration of all the critical areas under isolation technology. Isolators are intended as sealed enclosures that provide a physical and aerodynamic barrier from the external environment for the specific application of aseptic processing. equipped with an automated decontamination system using Hydrogen Peroxide or Peracetic Acid. Given their characteristics, Isolators can be installed in a class D environment, while being validated internally as Class A. This fundamental ability is what primarily constitutes the revolution of this technology compared to the clean room. 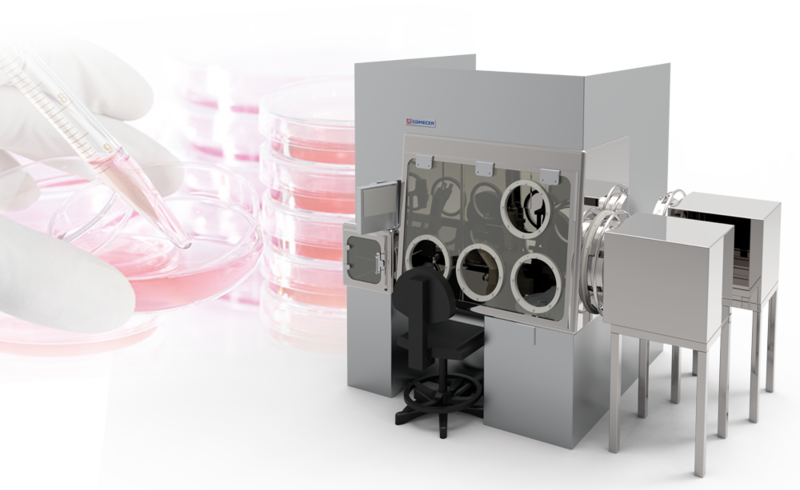 If this sounds like an effective solution to the risk of contamination in cell processing, we would just need to verify if the specific involved processes could be integrated within isolation technology. Fortunately, the answer is yes. It is possible. Results are impressive. If you wish to find out more about our proposed solution and the difference between clean room and isolators, fill the form.